We are proud of our homegrown artists, musicians, poets, dancers, and actors, and we look forward to sharing these experiences with you. 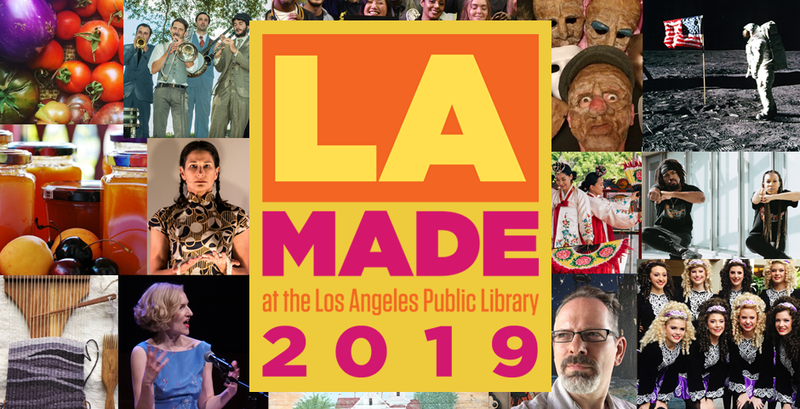 Check out the complete LA Made event listings or pick up an event calendar at your local branch library. LA Made is a cultural series featuring free music, dance, theater, and conversations with local entertainers at libraries throughout the city. The series will run through the end of November and is full of wonderful new program experiences. We have our exciting Central Library performances in the beautiful Taper Auditorium, where you can enjoy a one-of-a-kind quadraphonic sound concert by Suzanne Ciani, watch Viver Brasil’s “Cooking Samba” Afro-Brazilian dance and music program, hear from a local panel of those who worked on the Apollo landing in “From L.A. to the Moon: The 50th Anniversary of the Apollo Landing,” and even be entertained by our favorite Yiddish Drag Queen, Mitzi Manna! And that's just a sampling of what we have on tap this season at the Central Library. Free tickets for Central Library programs are available on Eventbrite six weeks prior to the show date. First in this season's line-up will be the return of “Strong Words,” the popular Silverlake arts salon bursting with storytelling, music, and a pop-up art gallery, on Saturday, February 9 at 2 p.m. The range of LA Made programs being offered at libraries throughout the city is just as vast, including Irish dancing with Cleary Irish Dance, hands-on crafts classes by French General and Papier-Maché Mask Making by Raze the Space, food programs on Heritage Grains, Cheesemaking, Growing Your Own Food, numerous theater programs, music ranging from ragtime to ‘60’s-era Folk sing-a-longs, Podcasting and DJ’ing workshops, Chinese and Japanese tea ceremonies, and much, much more! Here's a look back at some highlights from our previous season to get you excited for 2019!